This page includes selected articles from the 2002 issues of Across the Fence Post. Gregg Greenwald, veteran writer for ATFP, needs little introduction. Throughout the years, he has often shared his expertise in the area of modern U.S. postage stamp varieties. The following article reveals Gregg's added wealth of knowledge of U.S. revenues. Our thanks to Gregg for taking time away from his collecting activities to write all these informative articles. Some of the most beautifully engraved emissions of the 19th century can be found under the heading of "Revenue Stamps" in the major catalogs. By far the most popular to collect were those first issued in late 1862 to help the North pay for the Civil War. 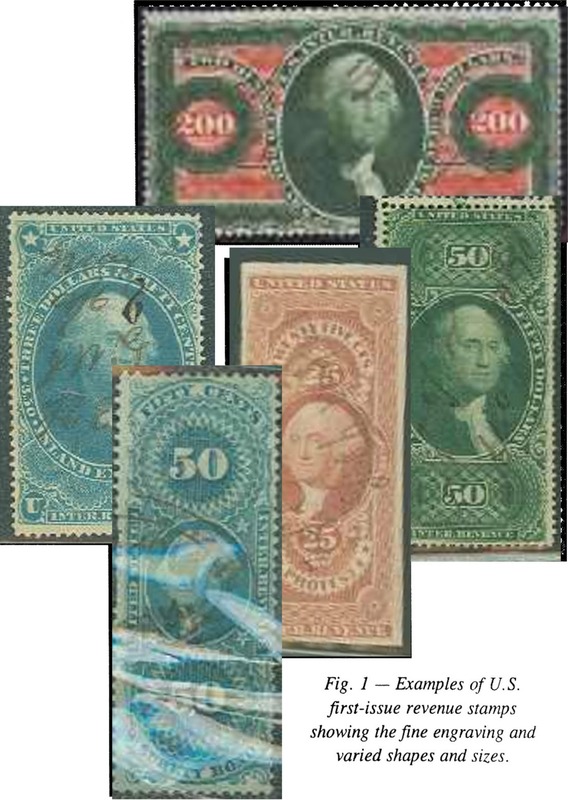 The stamps commonly known as the "First Issue" came in a variety of sizes, colors and denominations. Their fine engraving, availability on the philatelic market, and varied cancellations help make them collectors' favorites. 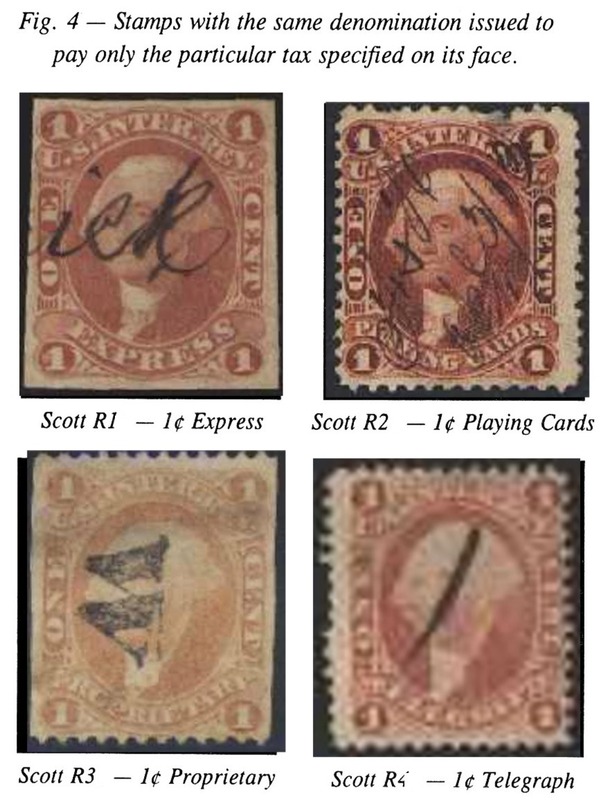 The grouping of stamps shown in Figure 1 is only a sample of the kind of material included in the first-issue revenues. Figures 2 and 3 depict examples of the many interesting documents on which revenue stamps are found. The printing firm of Butler & Carpenter of Philadelphia was awarded the contract to print the revenue stamps. The first stamps were delivered to the government in late September 1862. They would continue to print the stamps of the first issue until 1871. Just under 1.5 billion stamps were issued between 1862 and 1871, with a face value of nearly $100 million. A third of the total face value came from the 2-cent, 50-cent and $1 denominations; the 2-cent values were printed in a quantity of over 650 million. The original tax law stated that a revenue stamp could only pay the particular tax specified on its face. For this reason, several denominations can be found with various titles . One-cent stamps, for example, can be found with titles of "EXPRESS," "PLAYING CARDS," "PROPRIETARY" and "TELEGRAPH." (See Figure 4.) It was thought that great statistical data could be gathered about the types and quantities of taxes being paid. By December 1862, the practice was abandoned and the stamps could be used indiscriminately. The only exception was that Proprietary and Playing Cards stamps could not be used to pay documentary taxes, but could only be used interchangeably on proprietary articles such as matches, patent medicines, perfumes, playing cards and photographs. 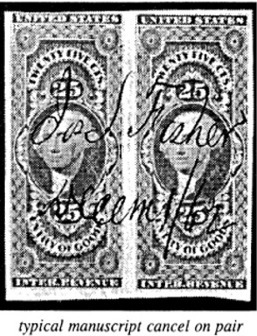 Figure 5 shows an improperly used proprietary stamp on document. First-issue revenue stamps can be found with three different perforation types: imperforate, imperforate vertically or horizontally (better known as part-perforate) and fully perforated. Despite what is commonly believed, the perforated stamps were issued first. By November 1862, it was found that the perforating equipment could not keep up with demand and orders were given to deliver unfinished stamps. Many of the first-issue stamps can be found imperforate or part-perforate. A quick check of the Scott Specialized Catalogue of United States Stamps and Covers shows that a few imperforate stamps are actually priced less than their perforated counterparts. The 2-cent blue Certificate and the $1 Mortgage are examples. Also note that while the majority of the part-perforate stamps are imperforate horizontally, several exist imperforate vertically as well. Several color changes occurred during the life of the issue. Some were deliberate, like changing the colors of the 2-cent stamps from orange to blue and back to orange. Others were due to inconsistent mixing and instability of the inks used to print the stamps. Several stamps were deliberately printed in an ultramarine shade starting in 1869. Examples include the 2-cent Proprietary, 10-cent Contract, 10-cent Foreign Exchange, 50-cent Conveyance, 50-cent Surety Bond and $15 Mortgage. The reason for the color change was to stop the washing and reuse of stamps. Many of the other first issues can be found in a range of colors. Early printings of the $1 and $5 stamps are dull red while those printed in 1870 are bright red. Purple stamps such as the 4-cent Proprietary, $1.90 Foreign Exchange and $2.50 Inland Exchange can be found in a vast array of hues. For the majority of the first-issue stamps, the paper used was a very hard, brittle paper (usually called old paper). In 1869, however, the government decided that it would begin to supply its own paper. As sometimes happens, the government was not able to deliver on its intentions and Joseph R. Carpenter (Butler had passed away in 1868) was forced to find a supply of paper on the open market. One paper used was very soft and usually quite porous. Another paper was similar but also contained small amounts of silk threads (better known as experimental silk paper). The final type was very hard, rather brittle and very thick, almost like a thin cardboard. Experimental papers were also tested. Usually, the stamps printed during the paper experiments were destroyed. Nevertheless, some 2-cent Bank Check and 2-cent U.S. Internal Revenue stamps printed on the experimental green paper were accidentally issued in 1866. Major catalogs only list the paper types of old paper and silk paper. The soft, porous paper stamps are grouped along with those printed on old paper. The stamps printed on experimental silk paper are easily overlooked. Generally speaking, stamps had to be canceled with the date and initials of the person performing the cancellation. For large firms, it was economical to have hand stamps made with the name of the firm and an adjustable date. Many firms that dealt in proprietary articles had sheets of stamps precanceled. The Scott Specialized Catalogue of United States Stamps and Covers makes note that its prices are for stamps canceled with pen and ink. Hand stamped cancels sell for more, and printed cancellations are scarce. Proprietary stamps could also be canceled with just a straight pen stroke. This was allowed because Proprietary stamps were meant to be destroyed when the article on which they were placed was opened. Some collectors have made impressive topical collections of the cancels found on first-issue revenue stamps. There are railroad cancels, oil company cancels, and drug company cancels. Many different colors of hand stamped cancels also exist - including blue, red, green, and black. Sometime around 1870, hand stamped cancels came into use that broke the paper in a series of dashed lines that resemble > > > >. These are commonly called herringbone cancels. Herringbone cancels, punched cancels, and other types that break the surface of the paper sell for less. 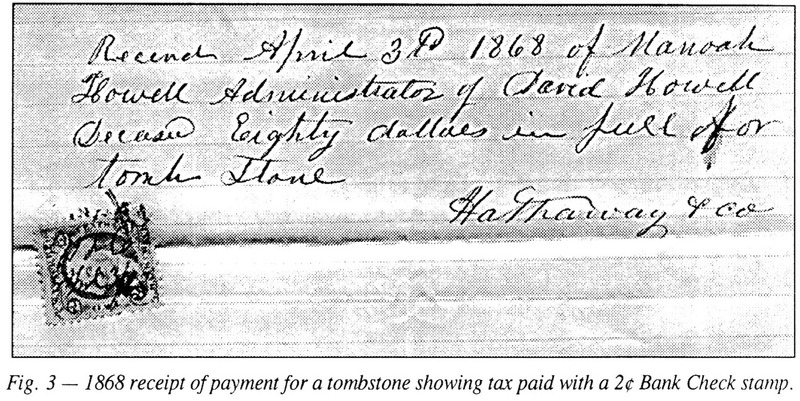 It must be remembered that the first-issue revenues were introduced in 1862. Perforating was not an exact science and, just as their contemporary postage issues, many of the stamps are poorly perforated. Butler & Carpenter (later Joseph R. Carpenter) was paid by the number of stamps delivered, not by the centering of the stamps delivered. Therefore, the vast majority of stamps found are off-center. Four-margin perforated copies can be quite scarce for many of the issues. The documentary issues were placed on receipts, bonds, mortgages, and other legal papers. These documents were often folded before they were filed. Some-times, because of the sheer size of the higher denominated stamps, the folds affected the stamps that were affixed to the documents. Also note that the paper of the 1860s to which stamps were affixed, and even the ink used for cancellations, could be highly acidic. Many Proprietary and Playing Card stamps were folded over the openings of the taxed item. Thus, creases and tears are common among such issues. The best example of attrition is the 6-cent Proprietary. While the print quantity was just under 90,000, few examples remain today, and all of those are faulty. Scott even places a note below the listing stating that nearly all copies are faulty and poorly centered. Experience has taught me that there are several things to look for when buying first-issue revenue stamps. Prices in the catalog are for copies with very fine centering and without faults. The majority of the stamps are poorly centered. Faults abound. Short perforations, pinholes, creases, repaired tears and thins are common. Many of these faults are not described, so always be careful and thoroughly inspect the stamps before making any purchases. Certainly, album spaces can be filled with such items, but make sure the price is appropriate. Imperforate and part-perforate issues are extremely dangerous Far example, a good number of items being offered for sale online at eBay and the APS StarnpStore are not verifiable. They may actually be what they purport to be, but they could also be examples where the perforations have been clipped off. It is just too hard to tell. Multiples, of course, can offer proof, but are difficult to find for sale, especially in good condition. By no means am I an expert, but I am comfortable buying singles of the imperforate and pan-perforate issues. I make it a point to avoid stamps that are questionable. I also make it a point to get expert certificates on any imperforate and part-perforate stamps I buy with a catalog value over $100. It the seller does not agree with those terms, I will not buy the stamp. Silk issues are also some of the most misidentified stamps. Silk fibers must be present in the paper of the stamp itself and are rarely longer than one millimeter. Dirt and other surface-clinging debris found on the back of the stamp do not qualify. Many of the silk paper varieties in my collection actually have silk fibers under the ink on the front of the stamp. I feel it is wise to get certificates on any of the first-issue stamps that have a high catalog value. Perforated copies of the $1 Mortgage (catalog value of $175 perforated, $20 imperforate) can be created from imperforate copies. The $20 Probate of Will is extremely scarce in sound condition. The 2-cent Bank Check on silk paper (catalog value $250 versus 25-cent on old paper) is another example where a certificate is a must. If you are spending money on a copy of these stamps, be sure to get an expert opinion. It is well worth the investment! There are several excellent sources of information on first-issue revenues, all of which were used to compile this article. The introduction found in Scott contains good starting information. A Historical Reference List of the Revenue Stamps of the United States. by Toppan, Deats and Holland (better known as The Boston Revenue Book) is an excellent historical reference. The Revenue Stamps of the United States, by Christopher West also contains valuable information. Finally, The American Revenuer, organ of the American Revenue Association, has countless articles on collecting the first issues. I would be happy to recommend anyone for membership. John Pare has been a stamp collector for 49 years. He currently collects all aspects of Bermuda philately; Marine Corps postal history; and Madison, W7, and Holyoke, MA, postal history. John frequently exhibits his Bermuda collection. He's a longtime member and former president of the Badger Stamp Club. He also belongs to the Wisconsin Postal History Society, Bermuda Collectors Society, British Caribbean Philatelic Study Group, Military Postal History Society, and the American Philatelic Society. John is the principal of Mount Horeb High School, Mount Horeb, WI. Each type of mail was processed by a different division within the larger censor-ship network and each division had its own set of marks and labels. Terminal mail refers to mail sent to or received by Bermudians corresponding with outsiders. There was no internal censorship of mail in Bermuda. The distinguishing mark on terminal mail is the circular mark with the words "Passed by Censor Bermuda" printed on the inside edge of the circle along with a number ranging from 1-50 that identified the specific censor. This circular mark measures 30 centimeters in diameter and is commonly green, although it has been seen in black, purple and blue. Often there are no other censor markings. 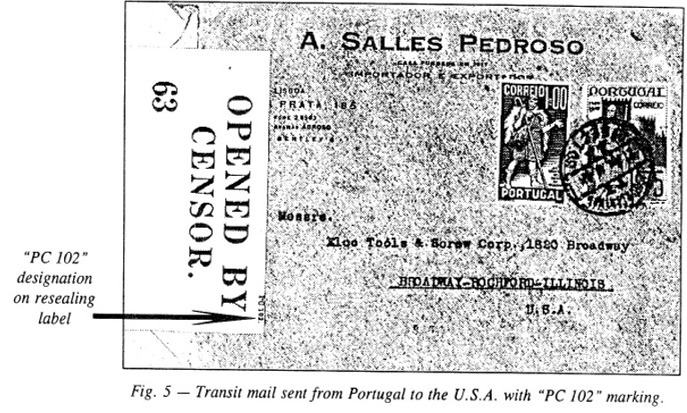 This indicates that the censor did not open the mail but simply stamped it and passed it on (Figure 1). When the letter was opened and examined, it was resealed using censor tape (Figure 2). Extensive research has been done on the attribution of the various numerals inside the censor’s circular marking as well as the various types, printings, and numbers associated with the resealing tapes. 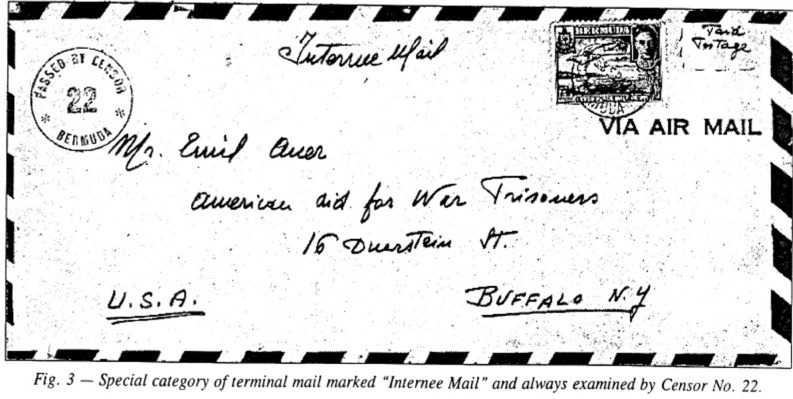 A special category of terminal mail is mail marked "Internee Mail." This mail was always examined by Censor No. 22. Bermuda held a small number of Germans or German sympathizers during the war. These people were either Bermuda residents at the outbreak of hostilities, people removed from ships captured at sea or prisoners of war. They were allowed to mail two letters monthly. These letters were sent "free" by surface mail, or the individual could pay the 7 1/2-pence airmail rate. Markings usually appear clearly on the front of the letter (Figure 3). Transit mail refers to mail removed from the trans-Atlantic clippers, examined by censors in Bermuda, and placed back aboard the clippers for the completion of the journey. Because of Bermuda's strategic location, this effort was important to the British and American intelligence gathering effort. At the peak of the war, over 2,000 women, called censorettes, were employed to examine this transit mail in Bermuda. Westbound mail from Europe is much more common than eastbound mail. Mail posted in Switzerland and Portugal (Figures 4 and 5) is more common than mail from other continental countries, though there are censored covers from every European country, including Germany. Again, extensive study has been made of every aspect of the censoring process - the various censor markings, censor numbers, style of resealing tapes, etc. Suffice it to say here, if you have mail with the handwritten or printed initials "I.C." 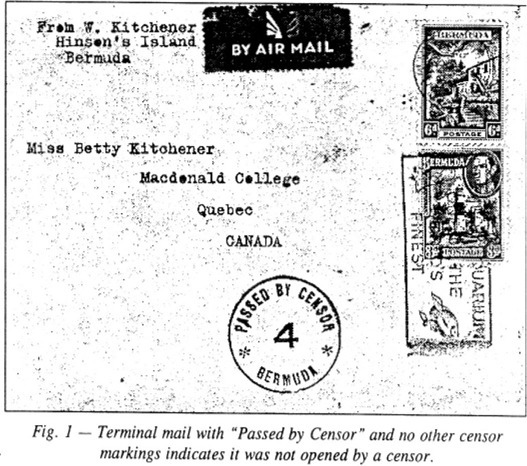 on the censor-resealing label, it was examined by the censoring authorities in Bermuda (Figure 4). The -I.C." designation was used only in Bermuda, with "1.E." used in Trinidad and "I.D." used in Jamaica. The period between late 1939 and mid-1941, however, is marked by much confusion over whether or not covers were examined in Bermuda because the censorship office had not yet standardized the resealing labels with unique identifying codes. During that period, resealing labels used in Bermuda carried various designations (PC 22, PC 102 [Figure 5], B.C. 1), none of which were unique to Bermuda. 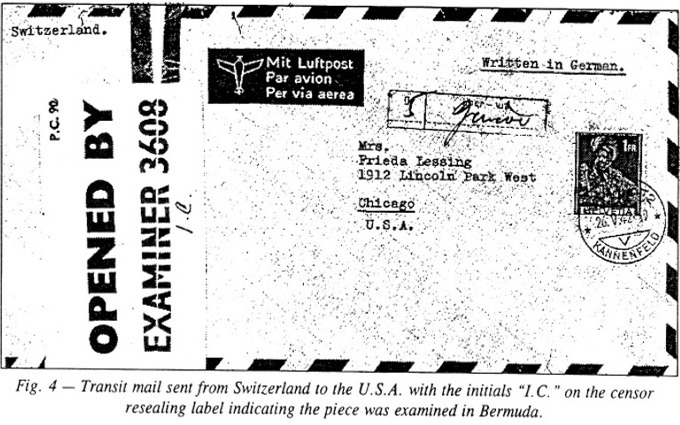 However, since Bermuda censors examined 90 percent of the mail between Europe and North America, one is on the right trail to think that covers from Europe to the U.S.A. carrying any of these label markings transited through Bermuda. Trinidad handled most of the mail between Europe and South America. To identify the marking variations that would make further transit mail distinctions possible is beyond the space available here. This whole area has been studied extensively by Bermuda collectors and a bibliography of references is available upon request from me (send SASE to the ATFP editor). Finally, detained mail refers to letters and parcels intercepted between 1940 and 1944 and detained until after the war. It took several years after the war for this mail to be released and forwarded to the addressees. It is generally believed that detained mail was gathered at several censorship stations in British colonies in the Atlantic area and forwarded to Bermuda for safekeeping, Not much of this mail survives in philatelic hands and is considered rare. The most common markings seen on this mail include "Condemned" and "Released by Prize Court." These are judicial markings applied by the prize courts, not post office or censorship markings. In conclusion, Bermuda occupied a key strategic location astride the Atlantic sea-lanes and air routes. 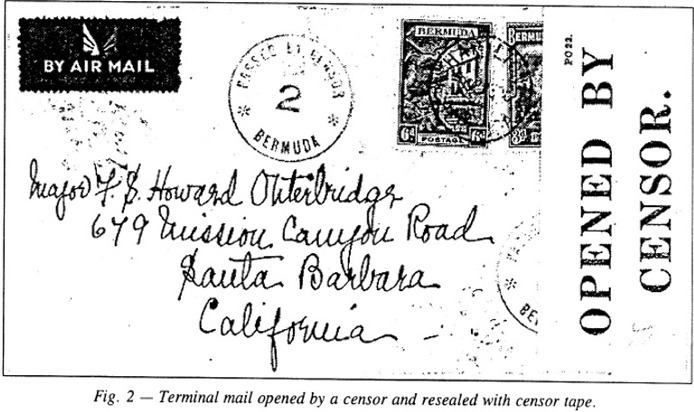 Recognizing the intelligence value of information intercepted from the mail, the British set up a major censorship operation in Bermuda. You may have (1) covers that represent the correspondence of Bermudians, (2) covers that represent correspondence between Europeans and Americans, or (3) covers that were deemed too sensitive to forward and were seized for distribution only after hostilities ended. The first category will likely be franked with Bermuda postage and may carry a small variety of censor markings. Covers in the second category will be more difficult to identify since they will carry no obvious connection to Bermuda. One needs to know more about the censorship labels to positively identify these transit covers, with the "I.C." mark being the trustworthiest indication that the letter was examined in Bermuda. And finally, if you have a cover seized by the prize court, you have a scarce item. Being a New Englander living in the Midwest, I spend many of my vacations in Maine and Massachusetts. While planning my vacations, I always check the philatelic calendars for shows that I might attend. Finding a show or a "new" retail store selling philatelic items is always a bonus to a vacation, and talking collecting ("shop") to kindred souls makes it all the better. This year, my travels took,4ne to the Burlington, VT, and area. In Essex Junction, I found a retail store selling coins (their expertise), Vermont collectibles, and some stamps and covers. Local collectors consigned some of the stamp items but all were priced fairly. A number of purchases later, I was quite content to note this location for future visits and moved on in my travels to Maine. I had noted in Linn's Stamp News and the American Philatelist that a show and bourse was to be held August 3 in Ellsworth, ME. Maine hosts a number of shows, but rarely is one held close enough to my vacation spot to tempt me. This show, however, was circled and underlined and I was going to attend. Through a local want ad, I also made arrangements to meet a local collector offering federal and state hunting stamps. I had my day lined up and planned. I additionally look for any antique shows, as paper ephemera sellers always have covers. These shows attract postcard dealers, too. Antique shows are common in Maine during the summer months and attending one resulted in purchasing some nice covers and several rare-usage postcards. Not only was my vacation going well but I was adding to my collection and having loads of fun doing it. I have (as I assume many other collectors have) discovered that local shows favor material from that area. After all, the local collectors are usually interested in this material, and this is especially true with postal history from a generalized area like the Mid-west. But traveling to different geographical locations can also provide unexplored areas within dealer boxes that have little interest to the local collector. It is here that you may discover that item which has been eluding you for some time. August 3 was a sparkling blue-sky day with heavy traffic to Bar Harbor and Acadia National Park. Ellsworth serves as the last large town before the entrance to the park so I wondered what the attendance would be at the show. Arriving at the Elks Club hall and registering, I noted packets of stamps for junior collectors and an auction with tables of postal history and stamps nicely presented on club lot sheets, a double row of easels supporting nine-page frames with exhibits, five dealer booths in a U-shape surrounding the exhibits, and a U.S. Postal Service clerk selling USPS year sets and some current stamps. Where to begin!!!! I headed to the exhibits and found them to be well presented on obviously well used frames. Next, on to the auction, which took a fair bit of time to view and track, as there were so many lots. The table auction format was one I was unfamiliar with. Writing them on the respective lot bid sheets entered silent bids. At a certain point in time, the "silent" aspect of the auction was concluded and the highest bid won the lot. If, however, a lot had five or more silent bids, it went to the oral auction. None of the lots at this event went to the oral auction. I was fortunate enough to win a number of lots, many with but a single bid over the fair reserves!! Now on to the dealers. U.S. stamps and postal history, worldwide stamps and philatelic supplies were all well represented at this small show with one dealer exclusively selling postcards. I visited all five dealers and was able to make purchases from four. One dealer had four tables of material I rarely see at small shows - literally full album pages of early U.S. match and medicine and newspaper stamps for those back-of-the-book collectors, a wonderful selection of postal history, an absolute overflow of covers in a bargain box, and gobs of postage at face value. All of this in addition to a well-represented offering of 19th-century U.S. stamps. The dealer was also very knowledgeable for all his extensive stock. Needless to say, he separated me from most of my show budget. I met the collector I had contacted and purchased a few recently issued used federal duck stamps. Since I had been at the show a couple of hours with most of my shopping done, I introduced myself to the local club members. They were interested to learn that I was from Iowa, but more importantly, how I had heard about the show. The fact their ads "worked" brought satisfaction to both of us. The attendance was good with individuals constantly coming and going but I was no judge to compare it to previous shows. With a little bit of foresight and checking show calendars, you can have a day of hobby activity on your vacation and find good opportunities to add to your collection. Just remember your want lists and tongs. Besides meeting the local collectors, the next time you are in the area, you may just find yourself at a local stamp club meeting. The WFSC Central Office recently received the two inquiries reproduced below. Both came as a result of the WFSC's website. Can anyone shed some light on these Wisconsin covers? Please share your responses with our readers by sending a copy to: Ken Grant, Editor, ATFP, E11960 Kessler Rd., Baraboo, WI 53913, kgrant@uwc.edu. 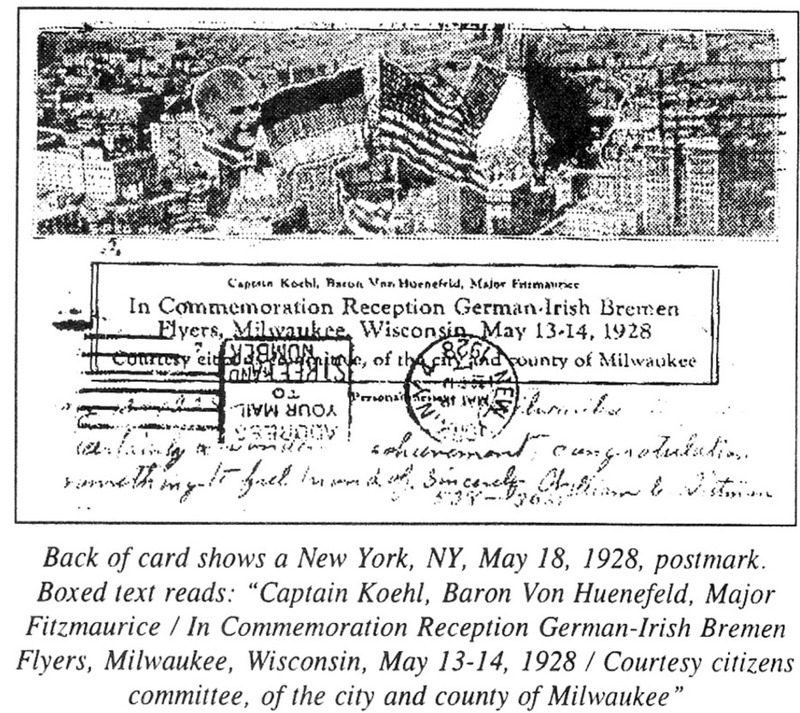 "Recently I bought a card originating in Wilwaukee [Milwaukee], being sent to Germany. It is a commemoration of the first flight from Europe to America. I have been able to obtain information about the flight, but I have no idea why Wilwaukee is holding a reception for the aviators. "Perhaps you [will] know somebody who may have this information; perhaps the local newspaper would have articles which I would be pleased to have photocopies of." "I have a first-day cover from September 26, 1969 [Scott 1382, College Football], produced by the Green Bay Philatelic Society and commemorating 50 years of pro football in Green Bay. It shows a helmet superimposed over an outline of the state. There is also a signature of Bart Starr, the former Packers quarterback and coach. ... Would you know if this FDC was issued with a stamped/printed signature, or is it possible that Bart Starr actually signed it?"